Did Pence just get the cold shoulder in Colombia? The visit of US Vice-President Mike Pence was by far the weirdest visit to Colombia of a foreign leader in the past decade. He left without anyone even noticing. 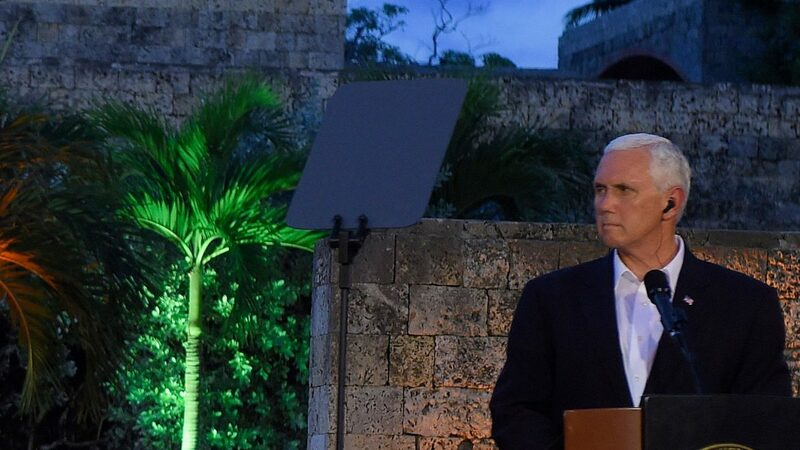 According to public records, Pence met with President Juan Manuel Santos and several of his cabinet members on Sunday, visited a Venezuelan refugee shelter in Cartagena on Monday and that was it. On Tuesday morning, the United States’ VP said he had arrived in Argentina for the second leg of his Latin American tour. The only formal meeting was the one on Sunday with Santos, Defense Minister Luis Carlos Villegas, Finance Minister Mauricio Cardenas, Trade Minister Maria Claudia Lacouture and Post-Conflict Adviser Rafael Pardo. General Oscar Naranjo, the highest official in charge of counter-narcotics efforts, did not even bother meeting with his American counterpart. It’s not that Pence didn’t try, I think. In the speech following his only meeting, the American VP on Sunday said everything Santos wanted to hear. Pence explicitly expressed support for Colombia’s peace process, praised a bilateral trade deal and tried to unnerve tensions caused by US President Donald Trump who had threatened to militarily intervene in Venezuela. Santos and a number of his Latin American counterparts had made it crystal clear that even mentioning military intervention was a bridge too far. His apparently empty diplomatic agenda did allow Pence and his wife Karen to visit Venezuelan refugees in Cartagena, and that was it. No business meetings, no meetings on drug trafficking, no meetings on defense. Nothing. Even local newspapers had different priorities. Pope Francis is coming in a few weeks, for example. Pence left Colombia without anyone noticing or caring. Nobody was there to wave the American VP goodbye. He might as well have stayed in Washington it seemed.